Downton Abbey fans will fall in love with Roseanna White’s historical, romance series Ladies of the Manor. 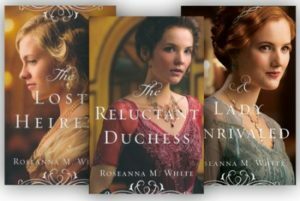 The three books are The Lost Heiress, The Reluctant Duchess, and A Lady Unrivaled. The spunky heroines push the boundaries created by their nobility, while they navigate proposals from the brave gentleman who dare to court them. Who doesn’t love a sassy Lady? Through the three books, the characters struggle to escape the dangers created by the Fire Eyes, priceless red diamonds. When people are desperate to save their family’s estates and hold on to their privileged way of life, kidnapping and murder are not out of the question. These books hit all the right marks: Beautiful and unique settings from Monaco to Scotland to Paris and of course English estate homes and castles; Complex and inspiring characters that evolve through the stories; and intriguing plots that keep the reader guessing. Escape with a Good Book – I’m giving two away.